Collectively, they have rescued a turtle, seen a heron catch and swallow a fish, survived a crash into a road sign and discovered neighborhoods they never knew existed. 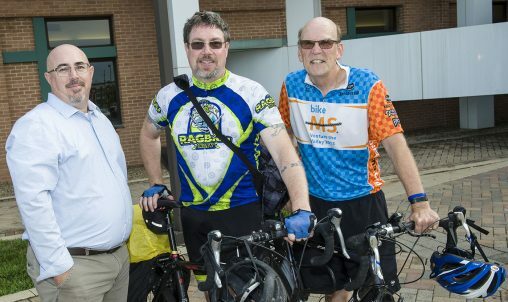 These are among the adventures of Wright State University employees who bicycle to and from work. Seth Gordon, director of Wright State’s Veteran and Military Center, has biked to work sporadically from his home in Yellow Springs for the past two to three years. The 22-mile round trip takes him about an hour-and-a-half. “This really gives you a chance to process through your day, let your day go, get the exercise I need,” said Gordon. Other Wright State employees share Gordon’s enthusiasm. Angela Griffith, assistant dean for academic affairs for the College of Engineering and Computer Science, has biked to Wright State from her home in the east part of Dayton for about 11 years. Eric Corbitt, director of Student Union Activities and Recreation, has begun biking from his home in Beavercreek. But neither can top Carl Brun, assistant vice president for university curricular programs. He’s biked to Wright State for the past 17 years. The 58-year-old Brun bicycles to work about three times a week from his home in North Dayton, a little over 12 miles each way. Most of the trip is on a bike path and takes twice the time it would take if he was driving, about 50 minutes each way. Brun used to be a distance runner, but he turned to biking when his hip began to hurt. “It’s exercise. It’s relaxing. It sets my mind free,” he said. Gordon, 47, also used to be a runner but had to stop after suffering shin splints. He has since become an evangelist for biking. When Gordon arrives at work, he showers, shaves and dresses for his job. 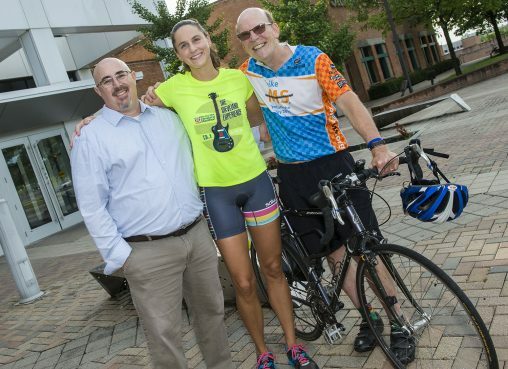 Griffith typically bikes to her job at Wright State one day a week — a 20-mile, 80-minute round trip. Griffith bikes for the exercise and to save a little money on gas. She says her commute is very bicycle friendly, with only the occasional inconsiderate driver. “I think it’s something a lot of people should consider if they have the accessibility to campus,” she said. Corbitt has just been biking to Wright State since May. It’s a 12-mile, 70-minute round trip. He said he has discovered neighborhoods he never knew existed even though he’s lived in Beavercreek for 20 years. And he once rescued a turtle that had crawled onto a busy highway. Corbitt, an advocate for biking, said the Dayton area has nearly 350 miles of connected paved trails, the largest network in the country. He says if more people would bike to campus it would relieve some of the stress on parking, make people healthier and help the environment. He says a proposal is in the works for a bike-share program that would enable students to better navigate the campus and the residential areas surrounding it. Corbitt, Brun and Gordon have had their share of adventures while biking. Brun has biked through severe thunderstorms and once crashed into a road sign, an accident that required 17 stitches in his upper arm. He also was once biking behind a car when a large tree branch fell onto its roof. He stopped to see if the driver and the young child she was transporting were OK. They were. A proposal is in the works for a bike-share program that would enable students to better navigate the campus and the residential areas surrounding it. Gordon once biked from Columbus to Yellow Springs and decided to veer off the main highway and try to find his way home on farm roads. He had biked for about 25 miles when he encountered a collie. The Wright State bicyclists all agree that preparing for the trips — dressing, collecting gear, applying sunscreen — can be pretty time-consuming. “The joke is that people like me are called MAMILs — Middle-Aged Men In Lycra. There is a lot of gear,” said Gordon. But he said he feels lucky as a bicyclist to be working at Wright State. Brun keeps pairs of dress pants, shirts and shoes in his locker to wear after he arrives at work.